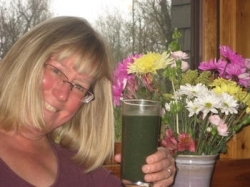 I've told readers on a variety of blogs, including some of my own, about being able to travel and still have your healthy greens and smoothies. It might sound funny to say "smoothie kit," but last year, I needed to get down to New Jersey to see my family in a hurry. My dad had suffered a stroke. He was convalescing with my sister. She needed a little help for a few days - especially since she and her family had already been booked to be out of town. For the time when she would be away, I would stay at her house with my dad - and of course she has a full kitchen with ample refrigerator and freezer space, as well as the usual stuff you'd find in most kitchens. What I knew she WOULDN'T have would be a juicer or VitaMix. She would probably have a blender, but I use these types of appliances HARD, and I didn't want to place any undo strain on hers. Also, for the initial visit, I would be staying in a hotel that had only a min-fridge. I didn't want to compromise the way I had been eating, which included (and still does include) fresh juice and smoothies. So, in this article, I'll show you how I prepared not only for that emergency trip, but how John and I now prepare for EVERY getaway, including fun weekend vacation getaways! This will show you that you can still keep your wellness program on track (at least somewhat!) while you're away from your kitchen. Some people think it's too much bother to make smoothies or to juice while on the road. While I realize that bringing a huge juice extractor IS a bit much when travelling, it is possible to stay with your program while you're out and about. So, when you are travelling, do you bring stuff to make smoothies? Yes, absolutely! There's no reason to discontinue my healthy smoothies just because I'm on the road. Well, I'd like to, but really... It's just too much hassle no matter what you say. I hadn't really thought of it before! But I'll definitely consider it now! I write frequently about Healthy Living Tips at my Self Development Blog Here! => Raw, unpasteurized almonds for sprouting Note: In the US, we can't buy unpasteurized almonds in the regular store - we CAN however, buy them direct from the grower. There are almond growers in California who offer unpasteurized almonds, and that's where I get them. My farmer of choice is Briden Wilson Farms. Tell 'em I sent you! :) (I do NOT get any commission from the farm…just a warm fuzzy feeling for sending them business). 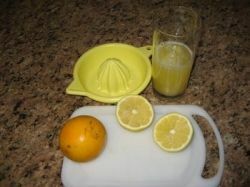 => Fresh Lemons and Oranges (and the reamer for squeezing; OR I pre-squeeze into a bottle for travel). Seriously, Vitamineral Greens by Healthforce are an incredibly superior greens powder. This is not a "chock full of sweetness" flavor - it's heavy duty power food. Some people don't like it. Some people say, when I offer it, "Eewww! It smells like fresh cut grass!!" (somehow, I don't have a problem with that!). At any rate, at the nearerst natural food store near us, a bottle of this powder costs over $70!!!! No joke! Sorry folks, but I'm still working on my first million... Here at Amazon I get the absolute best price. And trust me... I've looked everywhere! These are the things we bring when we need to make smoothies on the road! So, here are a few things that I've learned to bring with me over the years. It just makes life so much more pleasant! 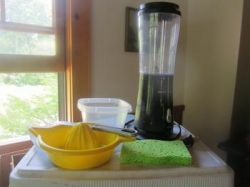 => A Mini Blender Look, it's just not realistic for me to always carry my juicer or VitaMix. The blender I currently have is a little Hamilton Beach (as seen in my photo) - inexpensive, and you can get them at any Target or Wal-Mart type of store. => A Reamer This is sometimes a little tougher to find. I like reamers with a solid bottom - like the old-fashioned glass ones (which I find often at yard sales, and so I have a few!). I also have an old plastic one that we use for travel. I like the solid bottom ones, because I use the pulp and don't want to lose a single drop! If you don't have a solid bottom one, that's ok - just do the best you can. => A Flexible Cutting Mat and Small Knife There is some prep involved on the road, and I don't want to hurt hotel counters, or trust that a little plastic knife from the continental breakfast buffet will always be available. => A Small Plastic Container This is just something small - like a Tupperware or empty hummus container. This is merely for soaking/sprouting almonds. => A Plastic Cup or Mug for Drinking Be sure it's large enough to fit your smoothie. I like to use a tall, 14 or 15 ounce glass. 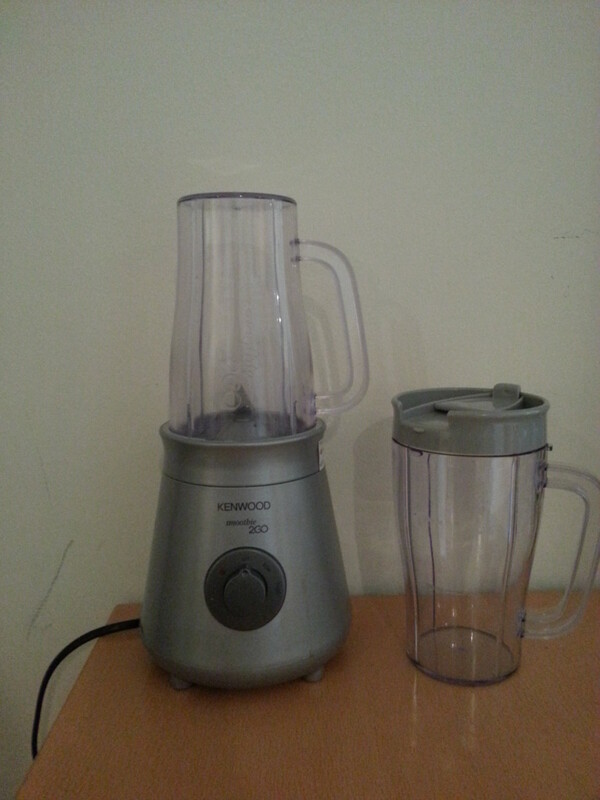 The smoothie maker that I have is more-or-less self-contained, and definitely fits the bill. But you might need additional glassware if you're making smoothies for more than just yourself. => Some Paper Towels or a Rag/Sponge This is to mop up any drips from the hotel counters. It's unkind to use their lovely white towels for this! :) Besides, the housekeeping staff won't know what all that "green stuff" is on their towels. Why cause a panic? All of this goes into a cooler with ice on the day of travel. Some Small Blenders for Travel - There are lots to choose from! You don't have to spend a fortune for a small blender for the road. Sometimes when we're travelling, we luck out and get the most amazing fresh produce from the locals! Do whatever's easiest for you - this method works quite well for us. Kale: What I'll do ahead of time is take the "reedy" stem off the kale, and then put a handful of kale (1 for every day) into a zipper lock bag, and squeeze as much air out as possible. I keep that refrigerated. Strawberries, Bananas and/or Any Other Fruit You Want to Use: I wash, then pre-cut them. Then, I divide them into servings - depending on how much you want per smoothie. A rough measure for me is about 12 strawberries and Â½ a large banana per smoothie. If you like, you can add a quarter cup or so of other chopped fruit. I then put each serving into its own zipper lock bag, and flatten it carefully. Then I freeze it until it's time to load the cooler and travel. Lemons and Oranges: Because I start each day with the juice of 1 lemon and 1 orange, if I know I'll have counter space I'll just bring them whole. Otherwise, I'll pre-squeeze them and put in a bottle. If it's not a really long drive, I'll simply refrigerate the mix. If I'm driving far - like 8 hours to where my family lives, I sometimes freeze it ahead of time to add ice to the cooler. Almonds: I only pre-soak (sprout) enough almonds to last the drive; primarily for snacking. Otherwise, I merely bring them dry in a zipper lock bag, and will soak just enough overnight in the hotel for the following day. 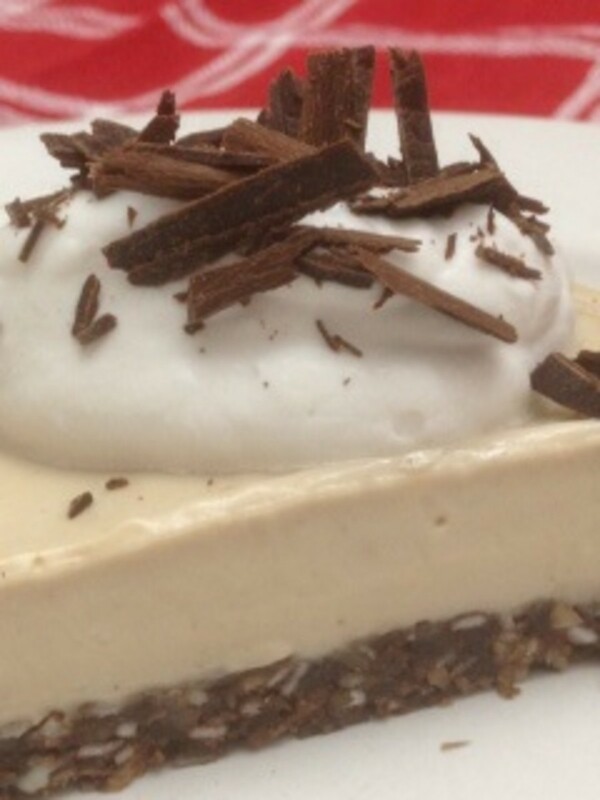 Some people are unaware of how awesome it is to be able to use raw, sprouted almonds! Almonds - if unpasteurized - can still germinate, and therefore have all sorts of wonderful yumminess and goodness "activated" once sprouted. Yup! This is our travel lemon and orange set up! Everywhere we go! The rest is pretty self-explanatory; but I'll quickly run through my morning routine. I really like to keep this as close to the way I do it at home as when I'm on the road. Yes, it can be a little cramped in hotel rooms - and some hotels don't have real glassware. Oftentimes, you get a flimsy plastic cup or paper based cup. This is why I like to include a good 14 ounce plastic "glass" in my travel kit. I begin the day with a glass of the lemon-orange water. I have been doing this (sometimes just lemon) for over 16 years. It really is part of my life. That plastic reamer goes with us even on our Caribbean vacations! After the juice, I begin making the smoothies. I will have defrosted a package of the pre-cut strawberries/banana/fruit mix, so that it will be very soft at this point. I pop that into the blender and liquefy it. Then, I add the kale and liquefy. 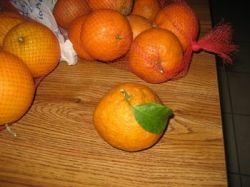 I cut up the apple (I discard the seeds and stems), but cube the rest of it and throw it in, skin and all. At this point, I simply blend it until it's a palatable consistency and down the hatch! :) Yum! I follow the smoothie with a handful (about 20 or so) sprouted almonds that I have soaked overnight. I know this does not sound complicated - but I have to tell you; I have NEVER felt more sustained and even-keeled as I do when I eat like this. I have made my Smoothie Experiences even easier these days! While I still love & use the Kale & Vitamineral Greens, I find myself throwing in Blueberries, 0% Fat Greek Yogurt (the good ones... nothing with any junk in it), and a couple tablespoons ground flax. I've been leaving out the apples and banana these days to cut the sugar content. STILL YUMMY!!!! This is the Omega 8005 Juicer - EXCELLENT juicer! As a quick update, I have been recently adding juicing to my daily routine - and I'll take about 4 carrots, 3 stalks of celery and a couple of tomatoes, and run them through my juicer. Then, I'll sip about 8 ounces or so of the fresh juice, and add the rest to a bunch of kale that I've placed in my travelling smoothie maker that you see here in this article. This way, I'm getting my greens as well as a real powerful infusion of nutrients from the juice itself. The reason I don't use kale in the juicer is that I currently have a Jack LaLanne Power Juicer - which is a centrifugal juicer and it just doesn't juice leafy greens very well. We're planning on getting an Omega or Champion juicer soon, which DOES juice greens really well. Wanna hear the kicker? We HAD an Omega a few months ago and sold it because it was too big to bring back north when we left Florida - we are totally kicking ourselves now. The Omega and other juicers like it are "masticating" juicers - which uses a sort of "worm" type of gear, and it pushes the material through the gear - it's a little slower than the centrifugal juicer, but I don't mind that. Now, what is the best juicer on the market? The guys on "Fat Sick and Nearly Dead" use a Breville (a centrifugal juicer - that is, it "spins" like a centrifuge and pushes the juice through a fine sieve-like filter). Now that I have used both... MY vote? The Omega! Hands down, we really like the "masticating" juicer because we want to be able to throw a lot of greens, wheatgrass, etc through the machine. Fortunately, we made a video of the Omega at work, which I'm putting below. Our Omega 8005 Juicer at Work - I WISH we still had this!!! 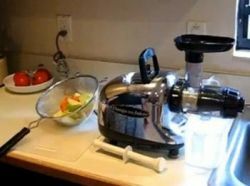 The Omega and Other Good Quality Juicers - Something for every budget! Not everyone has hundreds of dollars to spend on juicers and smoothie makers. One of the great things about Amazon is that they really do have some great prices. This is pretty much the one we had. It's really good - very heavy duty. The only thing we didn't much care for was the way the excess pulp came out. But, the juice is outstanding. OR... You can probably find a used juicer on eBay! - You can really get some great bargains! Hi! Thank you SO MUCH for indulging my desire to help spread the word about incorporating more fruits and veggies into our lives. Please tell me your thoughts about this topic! Thank you again! Will You Be Making Smoothies On the Road? - Please let me know you were here! I don't use kale by itself but in a spinach mix. Make mine ahead of time, freeze them and grab it as I head out the door. Works great for me, but it also depends on the type smoothie I feel like at the time. They're what kept me going when my husband was in the hospital. This blender is life saver. Now I can make my own smoothies on the go. Great idea. It is hard to think about travelling since I am making these dietary changes. Pinned to my special diets board. @anonymous: Thanks so much Susie! 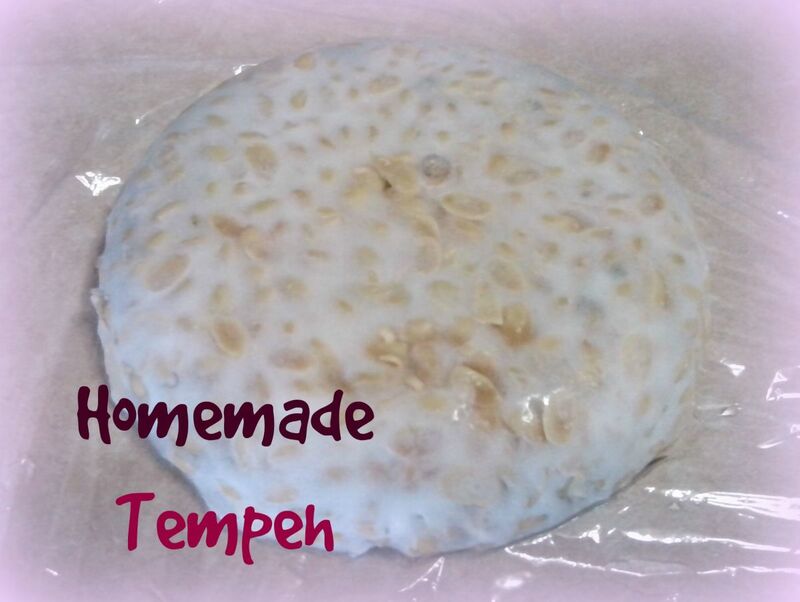 :) I had fun making it! I'll be traveling for the first time since I began doing smoothies every day, and although you make it attractive, I'll stick with buying my smoothies out when I'm traveling. This is a great idea, especially if organic produce might be hard to find where you're going. 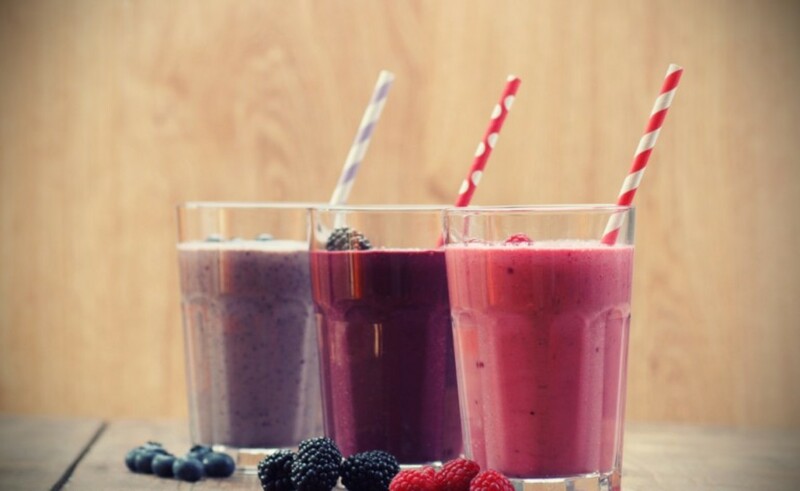 Smoothies are great, tasty and very healthy, i like them! I love smoothies, I drink them every day. @Echo Phoenix: Thank you! It works really well! @anonymous: You are welcome! I love this stuff! @Lee Hansen: Those are nice! I like them! VERY compact! Yes, I do, but I don't use an appliance - although I may buy one of those stick type immersion blenders. Hmmm. 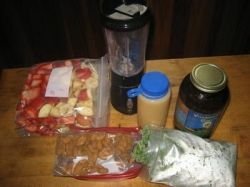 planning a wklong roadtrip in a few wks...and i'm planning on keeping with my daily smoothies...thanks for your tips!! Difficult to stay with the diet while traveling, it is really inspiring that you had stuck to it; very inspiring. I sometimes tend to overeat during travel. @Faye Rutledge: As much as I enjoy dining out, you're right - it's nice to have foods you're used to on hand! @YogaAngel: Believe it or not, that cheapo little Hamilton Beach does a pretty good job! Perfect for travel! Nice haiku! We're really working on upping our fruit and veggie intake in my family - smoothies are a great way to add more! This is a great idea! There's nothing like having foods you usually eat on hand when traveling. Great lens! You reminded me that I need to drink my greens every day. I have so much more energy when I do! I love my ninja pulse, but it still might be too heavy to travel with.